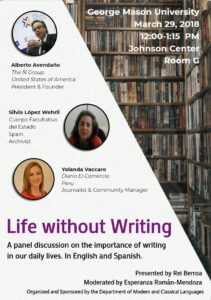 A panel discussion on the importance of writing in our daily lives. In English and Spanish. Yolanda Vaccaro, Silvia López Werhli and Alberto Avendaño. Presented by Rei Berroa, Chair Professor at Modern and Classical Lenguages School. College of Humatinies and Social Sciences. Moderated by Esperanza Román- Mendoza, Associate Professor of Spanish, Modern and Classical Lenguages. College of Humatinies and Social Sciences. Organized and sponsored by the Department of Modern and Classical Lenguages. George Mason University. March, 29, 2018. 12 pm. Johnson Center, Room G. Virginia (USA).